Practice is taken 6 days per week, with days off for new and full moon. If you are very tired, try just a couple sun salutations, a few seated poses, or practice the sequence backwards. A little bit still counts. Try to practice with a gentle, inquisitive intellect in order to avoid rigidity. Discipline is a necessary part of practice, but as Richard Freeman says, “Discipline is necessary to the correct degree.” Viewing the practice as a dull, rigid, dead thing runs the risk of burn-out, stagnation, or zealotry. Remind yourself to approach each practice with new eyes and a new mind, for though the sequences of poses may be constant, your experience of the practice will be different and new each day, and your approach must recognize that. Each pose is to be learned one by one, in order. Do not skip around or allow your personal preferences to dictate the practice. This allows the practice to do its work. That said, some poses are not appropriate for some practitioners. For example, someone who has had knee surgery can enjoy the full practice by doing lotus positions with crossed legs. It is best to have a teacher in order to have an expert opinion. If you do not have access to a teacher, practice in the most intelligent way you can; there are many alternatives suggested on this website. Many things maybe uncomfortable, unfamiliar, but if something is painful find a kinder way to practice it. Ashtanga uses the Tristana method, the “three-pronged” approach. 1) Asana. 2) Pranayama (Breathing, Bandha) 3) Drishti (Gazing point). Employing this method allows the practitioner to develop focus and concentration, keeping the mind busy enough to help ward off stray thoughts and distractions. Each pose is done for a minimum of 5 breaths. Some have a higher minimum number, mostly finishing poses. Any pose can be done for a longer period of time. I recommend spending extra time on poses that are especially challenging, or ones that feel particularly beneficial. In a led class—a guided “count” of the vinyasa—each series takes roughly an hour. 90 minutes is enough to finish the series, backbending, finishing postures, and rest. If you always have a short window of time to practice, say, 45 minutes or so, you can still practice full primary series by practicing standing poses and the first half one day, then standing poses and the second half the next day. It typically takes 1-3 years for a practitioner to become reasonably competent in the Primary Series. Its proper name is Yoga Chikitsa, or Yoga Therapy. This sequence is aimed at creating mobility in the hips (especially hamstrings) plus core and shoulder strength. The second sequence is called Nadi Shodana, Energetic Cleansing. It introduces deeper twists, a long section of backbending, and deep flexion, including leg-behind-the-head poses. I believe that everyone can and would benefit from learning primary series, plus the first half of second series. I have worked with a diverse group of people who are doing just that, from generally healthy 20-somethings to 36 year olds with hamstring injuries, to 50 year olds with 2 fused vertebrae and knee surgery, to 70 year olds with a previously sedentary lifestyle. I have seen amazing transformations through dedicated Ashtanga practice. If you have the motivation to practice, there are no obstacles that cannot be overcome. I think that full primary plus half intermediate represents the basic level of strength, mobility, coordination, and focus necessary for general health. The second half of second series onward demands intense dedication. It is generally accessible to those who make Yoga practice a high priority in their lives. The advanced series are known collectively as Sthira Bhaga, or divine resolve. They are very demanding of every faculty. If you practice more than one series, they are practiced on alternating days. When learning a new series, it is tacked onto the previous series until you have grown familiar with at least half of the sequence. For example, when learning second series, the first pose of second series, Pasasana, is done after Setu Bandhasana. The second series poses are added on one by one, until Karandavasana, at which point second series can be practiced by itself. Third series is tacked onto the end of second series until Hanumanasana. Fourth series is tacked onto the end of third until Mandalasana. Everywhere in the world, Ashtanga yoga practice begins with this mantra. To a long-time practitioner, it becomes a familiar friend and a welcoming presence, a signal to release the body and mind into the present moment. Mantra is not a blind devotion or guru-worship or religious indoctrination. It is a tool that we use to focus our minds. This transliteration is written phonetically for ease of learning. It is broken up by syllable for easy pronunciation. The IAST transliteration, along with the Sanskrit and full translation, is below. The opening mantra conveys a literal meaning, a metaphorical meaning, and an attitude. Each is equally valid and necessary. The attitude it engenders is one of receptivity. It serves as a reminder that we learn by the grace of our teachers—whoever and whatever they may be—and that, no matter how “advanced” we become, we always come to the practice as students. To be effective Yoga practitioners, we must expunge arrogance or conceit and be willing to learn and grow. Metaphorically, the first verse expresses gratitude to any and all teachers and the role they serve as healers; poisoned as we are by our participation and belief in cyclical patterns, our teachers help us to pacify harmful delusions. They are shamans, or physicians, who can enter the twisted “jungle” of our minds and guide us toward healing. They have walked the path that we are on, and they can provide guidance. Gurunam, or “the plurality of teachers,” can also mean “teachings as a principle,” encompassing all beings and situations, intentional or accidental, that have provided the fuel and means for us to learn. A conch shell. The conch shell is traditionally used at the start of puja (ritual ceremony) in India. It symbolizes divine sound, truth. The yogi seeks both to “hear” and generate truth. A wheel or disc. The chakra, or disc, represents a comprehension of cyclical patterns, of time, and, inversely, of eternity. A double-edged sword. The Yogi uses the “sword” of discrimination to “cut” or distinguish between truth and illusion. The Yogi seeks to cultivate the intelligence of discrimination; this quality is “double edged” because it shreds both external and internal illusions. Falsehoods of “external” reality fall away from the Yogi, and so too do internal self-deceptions, self-concepts, and ego structures. This process is often quite painful, perhaps more so than being cut with a physical sword. Having mastered these, Patanjali is further described as having “a thousand radiant white heads.” This is often visually represented as cobras “hooding” or surrounding Patanjali’s head. This references Kundalini (“coiled one”), which is represented as a serpent sleeping coiled at the base of the spine. All sensation and experience is ultimately a manifestation of Kundalini. Patanjali, having reached a level of mastery with form and spirit, has awakened Kundalini. pacifying the poisonous delusions of cyclical existence. a thousand radiant heads, a conch-shell, a discus, and a sword. This translation is with the assistance of my teachers and lineage. They are the few, among multitudes. They have a thousand radiant heads. I bow to these philosopher physicians. This has a somewhat different flavor than many common translations for this mantra. I am not a Sanskrit scholar. Translation is, by nature, inescapably imprecise and there is always a measure of interpretation and adaptation necessary. By presenting this translation, I am not implying that other translations are incorrect. However, there is a tradition in Sanskrit of playing word-games and deliberately crafting passages that can be legitimately read in several different, but ultimately consistent, ways. The first verse is from the Yoga Taravali, a classic yoga text. The second verse is of unconfirmed origin. The feet are considered important because the feet are the organ of action for travel, the vehicle for the journey of wisdom. In India, aspirants commonly touch the feet of their teacher or a statue, and then their own forehead, in hopes that some of the शेषा shesha (dust or residue) of that journey will bring good fortune on one’s own path. There are many variations on this: sometimes a devotee will touch their teacher’s feet, then their own eyes, ears, and mouth. Shesha also refers to the remains of an offering. When puja (ceremony) is done, the flowers/food/etc offered to the deity is not thrown away. Instead, it is considered to have been blessed by the deva (deity) and is distributed amongst the worshipers and attendants. दारि : Dari : To tear asunder. Darinam is the “plural” case, meaning an uncounted/uncountable number. One of the concepts very central to Ashtanga-Vinyasa practice is the Bandha*. It’s a word with a connotation of bridging, fastening, binding, connecting, or locking. 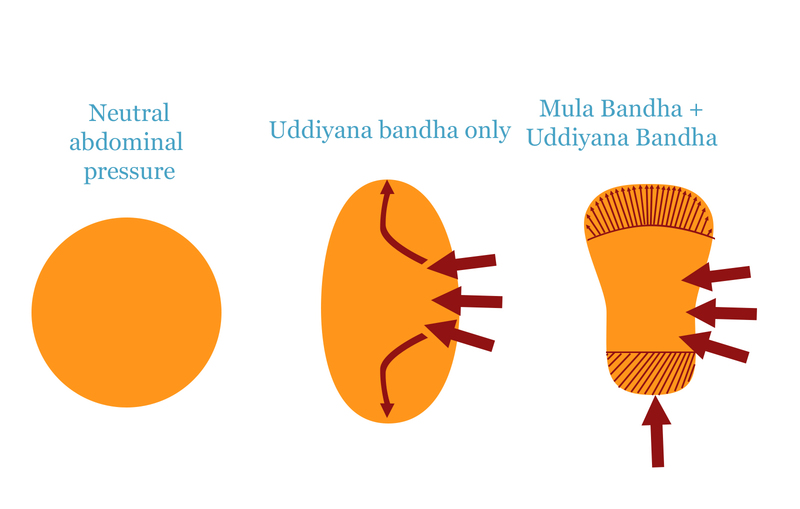 There are three Bandha discussed in historical texts and modern practices: Mula Bandha, Uddiyana Bandha, and Jalandhara Bandha. Much allure surrounds the Bandha, though they tend to be poorly understood and under-explained. This is my experience of the Bandha, an account of a living practice rather than a technical or philosophical perspective. The Bandha are not something to be understood solely by reading Hatha Yoga texts or the commentaries surrounding them. To be effective, they must be applied in an intelligent way to the body, allowed and felt rather than grasped at or created. I will describe two exercises you can practice any time to develop your own awareness, and then I share my own experience with the Bandha. Each Bandha has a specific location, a space inside the body, yet do not refer to any specific physical tissue. They may involve certain muscles or muscular movements, but are not defined by those movements. Instead, think of them as a type of awareness, a space in which various sensations, movements, or perceptions may take place. *Technical Note: In Sanskrit the word Bandha can be either singular or plural, similar to “deer” in English. Many people nonetheless add an “s” to pluralize Bandha, which tends to be clearer and habitual to English speakers. You will encounter both methods–there is no difference. Intellectual understanding is of limited use, yet a helpful first step. You must practice awareness of the Bandha yourself. Otherwise, my words will be gibberish when it comes to your Yoga practice – disconnected and meaningless. The process of trying to increase your awareness is important, regardless of the result. You may experience something different from what I describe. You may spend some months feeling nothing at all before it clicks. Yet the process itself is what is important – it develops the power of concentration (dharana) and has powerful effects on the brain and mind. While you can (and it would be helpful for you to) be aware of the Bandha in any situation, whether during your Yoga movement practice on the mat or while sitting or driving or falling asleep at night, I recommend two specific exercises to focus more completely on the Bandha without any other distracting elements as part of the discovery process. Uddiyana Bandha. Uddiyana means “flying upwards.” It is located in the lower belly. Jalandhara Bandha. Jalandhara means “net in the stream,” an evocative image of filtering or straining. It is located at the hollow of the throat. Maha means “great,” + “bridging, fastening, binding, connecting, or locking.” Mahabandha refers to the conscious awareness or practice of all three Bandha at once. This practice is an easy way to discover the location and sensation of the Bandha, and to keep refocusing yourself during the movement practice of Ashtanga. This is a seated, introspective practice that encourages the development of proprioception (sensitivity to the space and relationships inside your body) and concentration. I recommend doing this exercise after trying the Mahabandha practice described above. Sit comfortably. Padmasana (“lotus”), cross legged, sitting on a pillow or block, or in a chair are equally acceptable. Keep your spine straight and upright — avoid squishy chairs or laying down. Focus on your breath. Let it grow in your awareness, letting the sensations of breathing magnify. Start to notice your spine. 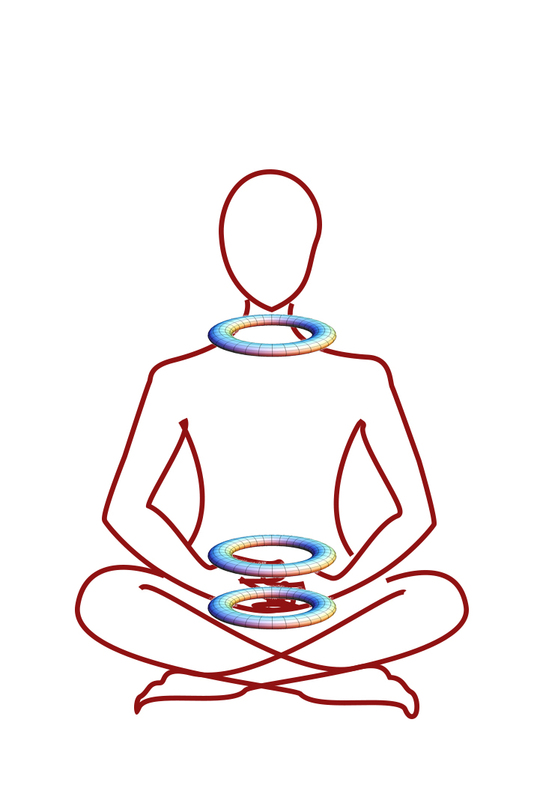 Now imagine or visualize the Bandha as three rings in the body: at the throat, lower belly, and pelvic floor. Being very precise with the location is not very important right now. You may notice that one spot in the lower belly is easier to focus on than the surrounding area. Keep your awareness there. This applies to the other two Bandha as well. Exhale fully. 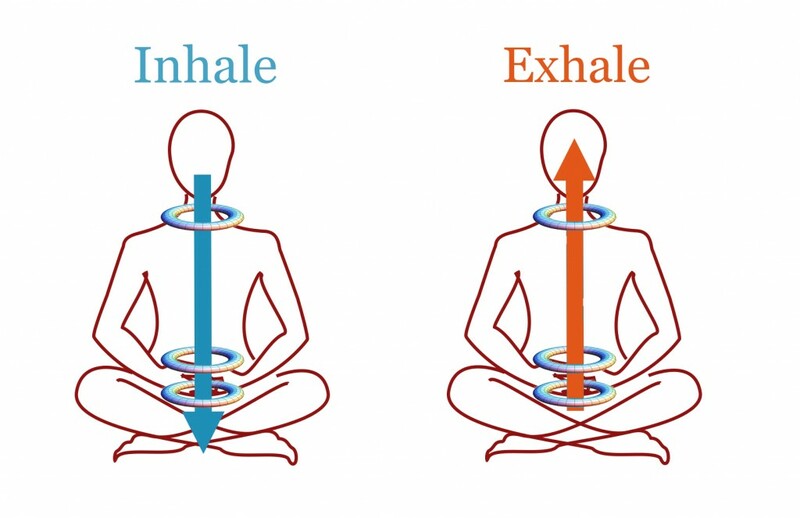 On the inhalation, imagine moving or threading your breath through the Bandha, one by one, extending the breath from the tip of the nose all the way down along the inside edge of the spine to the tailbone. On your inhalation, reverse the process, moving the breath back through the three rings until it has completely left your body. Repeat this process, staying as focused as you can, for 3-5 minutes. When starting this process, expect to spend most of your effort holding the image or feeling of the three rings in the body. You may notice that sensation or focus is isolated to one ring/Bandha at a time. It may take a great deal of concentration to maintain this exercise; the amount of focus required might even obscure any sensations. This phase may last for a week to several weeks, don’t be concerned that it’s not working. With consistent practice, you will need to expend less effort to maintain focus, and you will be able to expand your awareness to focus on or notice sensations in two or three Bandha simultaneously. Soon you will be able to have a “diffuse” awareness of the three Bandha, the thread of the breath, and the spine concurrently. At this point you will be able to be more focused on the sensations arising from the exercise rather than on concentrating your mind effortfully. It is not very important what exactly you feel during this exercise. Just notice whatever comes. Do not become ensnared in the sensation — you may notice that the novelty of sensation distracts you from the movement of the breath. Just remind yourself to refocus on the breath. It is not necessary to attempt any kind of physical movement or muscular contractions during this exercise other than sitting upright. However, the breath is created by and follows muscular movement. Noticing those movements – the contraction of the lower belly to exhale, the lift and contraction of the neck/chest muscles to inhale can help to direct your awareness appropriately, since these sensations are more tangible and noticeable. It is not at all important if you wonder if you’re imagining it or actually feeling something. In fact, if you don’t feel anything, use your imagination more. Sensitivity (proprioception) is a skill to be developed, and it has a manifest structure (the nervous system) which may need to be rebuilt or “reprogrammed.” Imagine what you think it might feel like, and you will be working towards developing that sensitivity. It is appropriate to start and/or end an asana (movement) practice with this exercise. You should also practice this during Dandasana and Padmasana in the Ashtanga series. In any pose that feels unstable, unbalanced, tight, restricted, or uncomfortable, practice this exercise for a few breaths (no need to do it for 5 minutes). Additionally, any time that you have to sit is useful. Consistency is much more valuable than duration. For example, I would recommend sitting daily for 3 minutes rather than waiting for days where you feel like you have more time and sitting once or twice a week for 15 minutes. In this account, I will describe the more tangible movements of the physical body, plus the subtler sensations of the energetic body. As you read my words evoking radiance, energy, warmth, and energetic movement, conceptualize it as a refined perception of the nervous system, or in Yogic terminology, as an experience of pranamayakosha, the “energy body” composed of vital energy (pranas). Whichever concept is more appealing and closer to your experience will serve you well. My experience has changed greatly over the course of my practice. This account does not reflect what I felt towards the beginning of my practice (mostly nothing) and what I might feel in the future. Please keep that in mind as you read this and practice yourself that you should not expect it to develop overnight. Physically, I feel a sensation of lift through the tissue of the pelvic floor. It is not a tightness or hardening but rather a tautness and stability, restraining downward movement of the pelvic and abdominal organs. My coccyx and surrounding soft tissue draws in towards my pubic bone (a noticeable physical movement). This is not a “tuck” of the pelvis; there’s no movement in my sacrum or other bones of my pelvis besides the tailbone. I do not always notice a physical component to Mula Bandha, but it is apparent in positions that put pressure on the abdominal cavity (Chaturanga Dandasana, twists, Utthita Trikonasana, etc), during which Mula Bandha provides a lift and stability. I also feel this as a pulsation that radiates from the space directly in front of the tailbone and sacrum. A glowing, perhaps. It has a suggestion of rising upwards in the way that waves of heat rise from a flame. This occurs in definite pulses of about 2 per second; it is not a continuous stream. The feeling of upward radiation can be distinguished for perhaps the distance of one palm-length, diffusing into the lower belly. There is a pleasant warmth and a feeling of gathering in the way that drops of dew might roll down a leafy bowl to coalesce in the center. During poses that require a focused strength through the legs, such as Parivrtta Trikonasana (Revolved Triangle), I feel as though the breath can be extended through Mula Bandha down the lengths of the legs. Although I had not been aware of my legs as being“disconnected” from the rest of my body previously, this application of Mula Bandha creates a strong sensation of the body becoming unified – that the legs are becoming integrated with the spine. This is a main sense of the word bandha – the “bridging” of a gap. I have a similar experience in other positions that challenge leg integration, such as Adho Mukha Vrksasana (handstand) or Utthita Hasta Padangusthasana. Physically, I often feel Uddiyana Bandha as a lifting of my diaphragm, drawing the organs upwards into the bottom of my rib cage. My ribs expand in circumference by about 7-8” and my waistline narrows and pulls in and lengthens circumferentially. My total height increases. This is accompanied by a sensation of being pulled tight in the way that fabric or Serran wrap could be pulled taut by tugging on its edges. The effort of such a movement lies not in my abdomen but rather with the diaphragm and perhaps the muscles in the ribs and shoulders. Under the pressure of my hands, my abdomen is soft and yielding, offering no resistance (quite contrary to a common interpretation of Uddiyana Bandha as a hardening or contraction of the abdominal muscles).The breath creates little movement in my abdomen. This effect is created as the organs (“abdominal viscera”) actually lift upwards, drawn into the rib cage with a vacuum-like sensation. This lift of the organs decreases the volume of the abdomen, creating a narrowing, while expanding the volume of the rib cage, creating an expansion. The kinematic pressure (think pneumatic pressure but with solids) of this lift is also a decompressive force for the spine, creating additional height and space between vertebrae. More subtly, I feel a sensation of electric dynamism, in the general shape of a sphere. Its center is located below and behind the navel. During the application of Uddiyana Bandha, it feels squished in against the spine, becoming less spherical in shape. Imagine squeezing a bag partially filled with water in your hand. With the application of Mula Bandha, it squishes upwards (one hand squishing at the very bottom, the other at the middle — the water can only move upwards). Without, it radiates both upwards and downwards (just one hand squeezing in the middle — the water moves in both directions). There is a pulsing here as well, as I described with Mula Bandha. It moves the rhythm of rising heat from below further up in my body, but it also feels much more expansive, radiating omnidirectionally to a perimeter beyond the level of my skin. The sensation of energy rising continues through my ribs to the level of the throat and shoulders. I experience this as a feeling of drawing inwards at the hollow of the throat. The sensation is strong and denser than the other 2 bandha, though more similar to Mula Bandha. It is in the same area that Ujjaii breath resides, but the two can coexist or be performed separately. The feeling of restraint or tightening from the bandha is very similar to that of the Ujjaii breath. The rising sensation is slower and more like that of an ocean wave or current of water, rather than the more delicate, fine electric vibrations of the lower bandha. It is strongly linked to a sensation of ‘gathering’ at the roof of the mouth, though I can feel it throughout my head. Physically, my neck and head draw back in space (relative to my torso), almost magnetically – without a feeling of conscious muscular effort. This is opposition to the common position of the head and neck being forward of the torso, often created by our habits of using computers, desks, driving, and other similar activities. If you think you have the Bandha pinned down and defined, chances are you’re wrong. There are many conflicting opinions. Being right about it is not very helpful to your practice. Being open to exploring and redefining and experiencing is. Just observe. You might not notice anything. You might notice something. What you notice might change over time. That’s all fine. The pelvis has three primary skeletal components: the right hip, the left hip, and the sacrum. While these pieces can move independently, they often work together as a unit, and the each piece exerts an influence on the pelvis as a whole. They will be discussed collectively in this article. 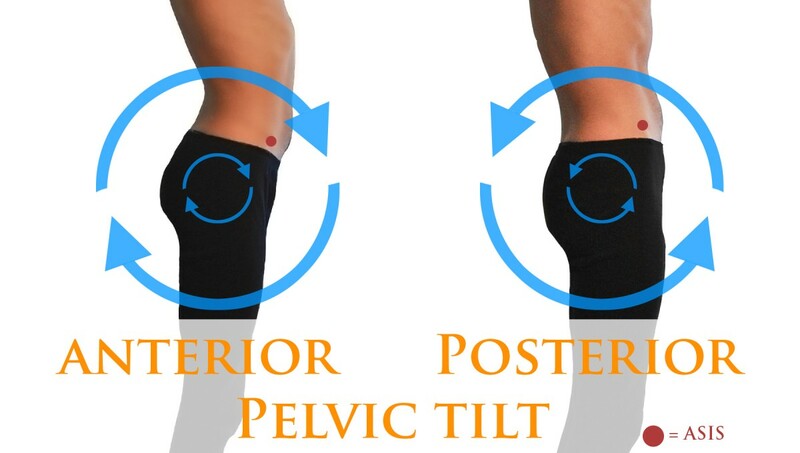 Pelvic tilt involves a simultaneous movement of both hips, the sacrum, and the lumbar vertebrae. To understand pelvic tilt, find your ASIS – a small bony projection at the upper front of the hip bones. When this point moves forward and down, the pelvis is in a state of anterior tilt. When the ASIS moves up and back, towards the spine, this is posterior tilt. The Latissimus Dorsi, commonly known as the ‘Lats’, is a broad muscle group in the back. 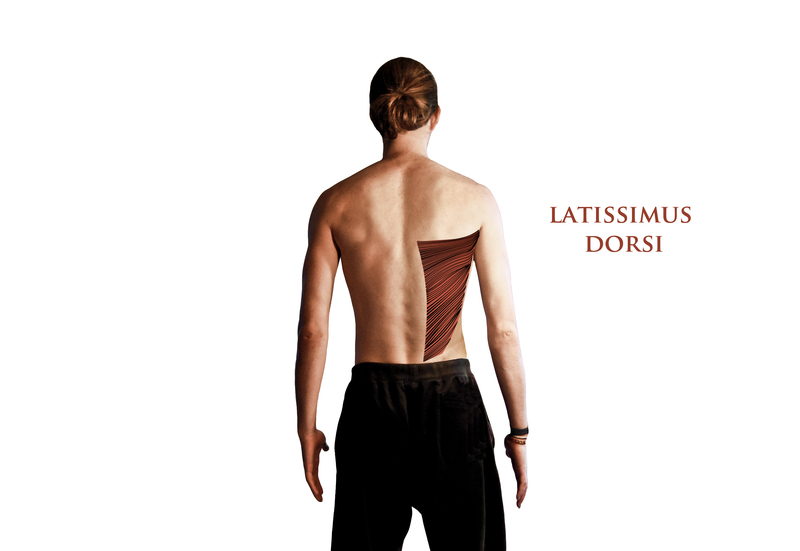 The lats connect (originate) from the spines that protrude from the back of the vertebrae of the sacrum, lumbar, and lower thoracic spine. They are also attached to the bottom edge of the scapula.